Given the growing proliferation of electromagnetic fields, in our homes, offices, schools and public places, as well as media coverage on the topic and mushrooming activism, many people, and especially real estate brokers, investors and lawyers, want to keep an eye on the public’s level of awareness about the risks. They are concerned for what liabilities might exist for brokers, building owners, building management companies, schools and coop and condo Boards. Will parties be able to find a safe harbor under the woefully inadequate FCC Radiofrequency guidelines, which only address thermal (or heating) effects of the radiation, not biological effects occurring from other aspects of exposure, such as the peaks and pulsing, the duration of exposure, and the cumulative effects? Or will those who knowingly allow radiating antennas be at risk? Many major insurers like Lloyds of London have long exempted cell phone health liability from policies, and wireless companies themselves in SEC filings acknowledge risks of litigation. While the debate goes on between industry and independent scientists, and between lawyers and courts, as it was for decades with tobacco, asbestos, lead paint, etc., everyday people in densely populated areas like NYC are finding ways to protect themselves from neighbors’ wireless emissions and neighborhood antenna infrastructure with shielding. Very much on their minds, besides the health risks, are the potential risks to their property’s valuation if located near antennas. In California, a couple moved out of their house to friends’ sofas, when for years now no buyer would buy their house across the street from a cell tower. They have had to keep paying the mortgage. In New Mexico, a sensitive homeowner was forced to live in his car when radiation from a nearby neighbor’s antennas reached into his house. People in desperation have moved to Green Bank, WV, where no wireless radiation is allowed due to the presence of a large government ‘listening telescope’. Disruption is occurring to peoples’ lives across the globe because of the health effects, and for real estate owners, whether they are sensitive or not, devaluation may be happening to their equity. A survey was conducted by the National Institute for Science, Law and Public Policy in June 2014 called: “Neighborhood Cell Towers & Antennas—Do They Impact a Property’s Desirability?” The survey was completed by 1,000 respondents. 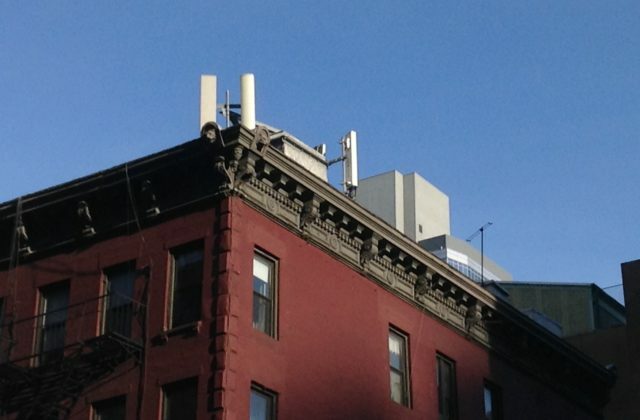 It circulated online through email and social networking sites, in both the U.S. and abroad, and sought to determine if nearby cell towers and antennas, or wireless antennas placed on top of or on the side of a building, would impact a home buyer’s or renter’s interest in a real estate property. (The survey did not ask about antennas in elevator shafts, as it was not known at that time that this was occurring). The National Institute for Science, Law, and Public Policy (NISLAPP) in Washington, D.C. was founded in 1978 to bridge the gap between scientific uncertainties and the need for laws protecting public health and safety.